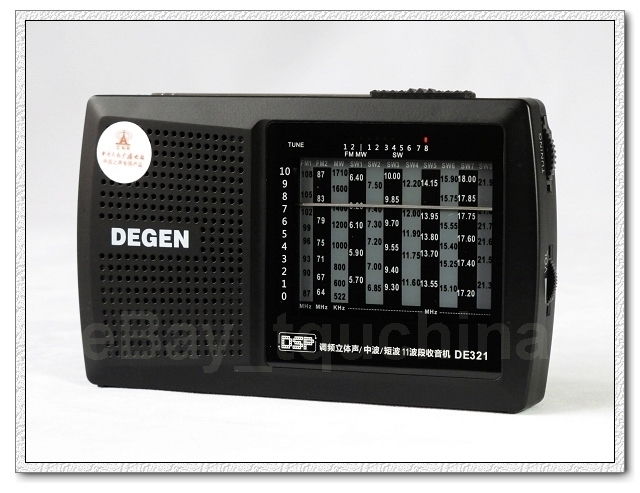 I recently purchased a Degen DE321 radio from one of our favorite eBay vendors: TQUCHINA. Tao Qu has consistently been excellent with his offerings, and this is another hit. The DE321 is based on the Silicon Labs Si4835 radio-on-a-chip. This newer Silicon Labs offering is an analog-tuned DSP radio, allowing for a pretty high performance radio (compared to other low-cost analog-tuned portables) with very few components, at a very low cost. I have been pleased with the performance, and the audio quality for what I paid. Rather than launch into a full revue, I am going to recommend you head over to The SWLing Post for Thomas' great review of the 321. I may revue the 321 at a later date in a comparison with some other radios I have. Until then please enjoy Thomas' excellent website. 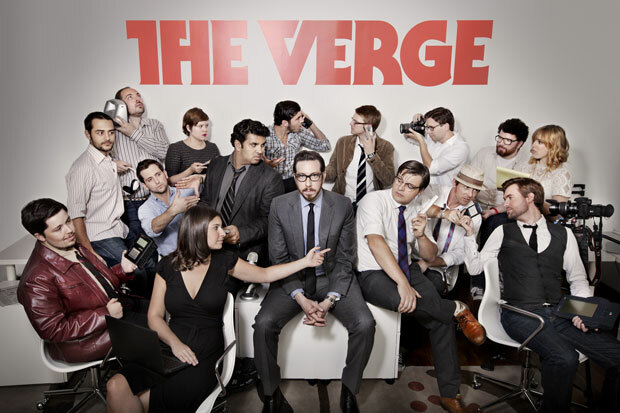 My former Aol / Engadget colleagues from ThisIsMyNext have finally launched their new technology site, TheVerge.com. Check it out! 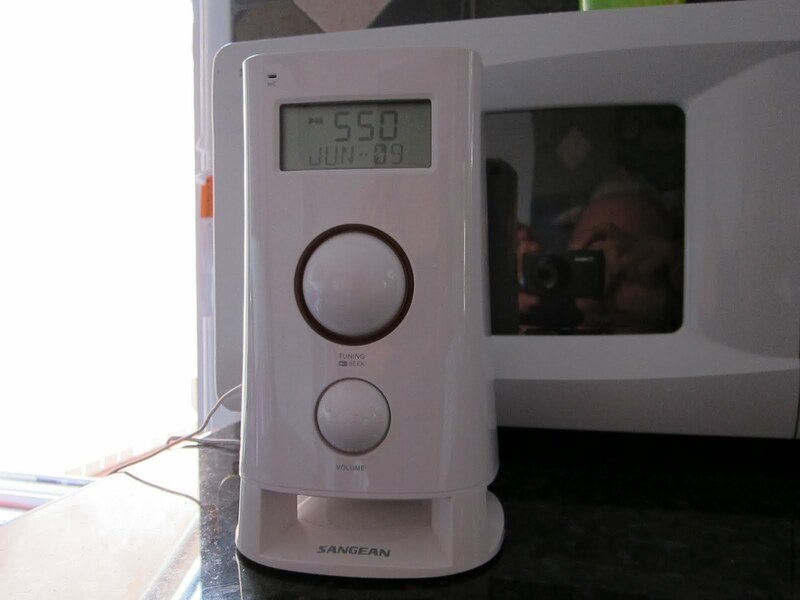 Here's a debate on AM audio quality over at Jeff McMahon's Herculodge that was started by some random comments about the Sangean K-200 kitchen radio I purchased recently. I didn't realize until this morning how much discussion this had sparked. I agree that modern AM radio will not sound as good as FM, but I'm not listening to music on it. For news and talk it is fine. This does not pass as an excuse for a poor-sounding AM radio though. The K-200 discussion that started this whole thread has been a bit exaggerated (possibly by my not clarifying the extent of the problem). Yes, it is muffled, but NOT to an unpleasant level. 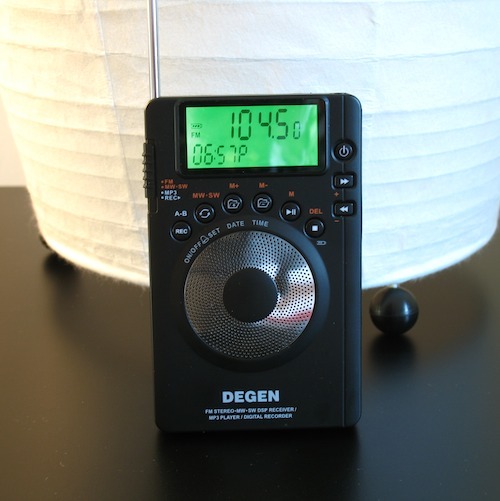 All in all it is much easier to listen to than some of my cheaper pocket models (Degen DE-205 for instance). There are some radios that make AM very pleasing to listen to though. Even though having adjustable bandwidth is a big help, my best sounding AM radio would probably be my antique Sears Silvertone tube radio. This is followed by the Redsun RP-2000, and the Tecsun PL390. The 390 is limited by speaker size, but has nice clear audio. My SuperRadio III (currently in my mother's senior apartment) is also pleasant enough to not cause migraines. The Kchibo D96L is actually a bit too bright, and sounds better with a dust cloth over the speaker. There is also a strange, and annoying "pumping" affect on strong AM stations (remedied by off-tuning by a couple kHz, but then that causes the soft-mute to kick in). The small headphone models that the Ultralight DX group recommend also sound very good when amplified through some basic computer or iPod speakers. The Sony SRF-M37 models are a bit too broad on bandwidth for serious DX-ing at times, but that shortcoming makes for great audio with strong local stations. The SRF-59 is also good amplified or through headphones. The mini that really disappoints in the audio department for me is my Degen DE-1123, which excels on FM for its size, but makes AM a bit murky. The K-200 will continue to play WCBS 880 every morning here on Long Island, and either the local NPR stations or WXPK-FM from White Plains the rest of the time. As I said, up on the fridge the acoustics are actually pleasant. There is a new FM all-news station in NYC now, but it's pretty awful. By the way, our other AM all-news station, 1010 WINS, still plays the teletype-ticker-tape sound effect in the background during the newscasts. Anyone else out there have this? I find it pretty hilarious. Power still out since Sunday 2AM. There was still enough hot water left this morning for a quick warm shower. Candles working well, thanks to Jill's intelligent use of aluminum foil. The oil lamp has become more than a decoration. Special thanks to P&T Surplus in Kingston, NY for the amazing LED flashlights. I collect radios, so we have had plenty of battery power for news and music. Cell phones have remained charged, and we still have some laptop battery life left, plus Internet service through my phone. We cooked about 10 meals worth of defrosted meat last night and put back in the fridge with ice bags. The weather has been cool enough that we're comfortable at night. Can't wait for the power to come back on though so I can buy some ICE CREAM! Our thoughts out to Lee and Dawn who sustained some damage which will keep them off the grid for awhile. You see, because of all of the hype (some say over-hype), we were ready. We froze lots of water bottles in advance. Didn't buy any perishable food starting earlier in the week, and picked up only shelf-stable things. Why do we still have hot water? Because we have ONLY used it for quick showers. If you have a tank water heater, it will keep the water at least warm for a few days. We made sure we had more than one phone charger for the cars, so the phones could be recharged. I have a campstove. Just a small butane one (like the ones they sell in the gourmet shops). A quick trip to Chinatown Thursday netted 4 extra cans of fuel. I know it's hard to believe, but candles were once used for lighting. No, they are not as bright as your Gucci torchiere, but along with something reflective, they throw more light than you think. The grill has a full tank of propane too. You'd be surprised what you can cook on a gas grill if you need to. I intend to bake on it tonight or tomorrow if the power is still out. Some preparation and common sense is all you need. I cannot believe the idiotic remarks over at LIPA's Facebook page. People downright cursing and screaming about them not doing their job, and not being prepared. How do you prepare for this? Oh, yeah, that's right. Build a big dome over Long Island. Someone suggested burying the wires. OK dude, here's a shovel. Start burying. If it was that easy, it would have been done. Others saying that the trucks and crews should have been in place BEFORE the storm hit. Well, that one is interesting. I think you would need a psychic to tell you where to put them, and some suicidal maniac crew members. A bunch of other people asked if they were going to be reimbursed for the days they were out. Hello? You don't SUBSCRIBE to electricity. You USE it. If it is off, then you aren't using any. After that, the cost of food thrown away was mentioned. OK. You KNOW there is a hurricane possibly coming. What do you do? Buy LOTS of perishable food? NO! Run down the fridge. Cook what you can. Get a cooler. Freeze some water bottles and 2-Liter soda bottles filled with water. Be ready folks. Last I checked Long Island looked like a bad place to be in bad weather. This is nothing new. Winter and summer here are like this. Don't want hurricane weather? Tired of snow? Move to Oklahoma. I here it's safe there. No really. Trust me. Tornadoes hate trailers. Some more discussion was about how ConEd was doing such great job compared to LIPA. Ummm... ConEd has mostly buried electrical service. Plus, the storm hit not that far from the Queens-Nassau line, meaning everything to the left of that line got lots of rain, while we got wind. LOTS of wind. Why were the crews not out immediately after the storm left? Well... the wind folks. The wind continued for hours. Last I checked being high up in a bucket truck in a 60 mph gust was not something that many people can manage without becoming a projectile themselves. Dorothy, Dorothy! It's a twister! We will continue to camp out in the house till the convenience of electricity returns. In the meantime... read up on how the electric grid works, why you should prepare for bad things, and HOW MANY 500,000 really is. End of lesson. I've been wanting to tell this story for awhile. I think now is the time to get it all down for the sake of remembering, learning, and helping to prevent others from getting in a situation like this. 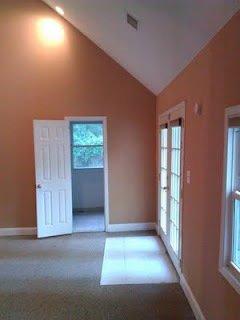 Jill and I were renting an apartment in East Northport from a great landlord. The apartment was in a nice private house, in a great neighborhood, walking distance to the train station. It was a huge two-bedroom with two full baths, a laundry room and lots of storage. The only complaints we had were the tiny kitchen, and a funky entryway which made it hard to move large things in or out. Otherwise, great apartment, and great landlord. Unfortunately, our apartment got targeted by the Town of Huntington rental enforcement people. Even though, it had the required number of exits, many large windows, smoke and CO detectors, a range hood, and everything else it needed for safety regulations, It was one of three apartments in the house, and local zoning laws allowed only two. The landlord contacted us about the inspection and told us we might need to move. He was very fair. We got our whole deposit back in advance of leaving to assist with finding a new place, plus some extra dollars for moving expenses. He gave us 60 days to leave. Further confirming that he was a good person, and a quality landlord. We found an ad for the place pictured above. New posts - new radios! 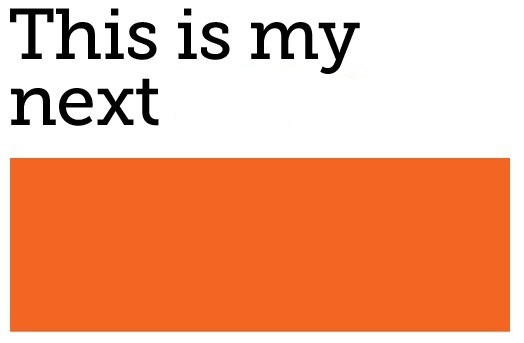 I know this space has been blank for too long. There's a lot going on in my life at the moment. I have picked up a couple of new radios (Tecsun PL-390 and Sangean K-200) and begun using my ultralights correctly with a Super Select-a-Tenna. Also, a great trip to Ed's farm again, and a BIG rant coming aimed at a certain landlord. Stay tuned! 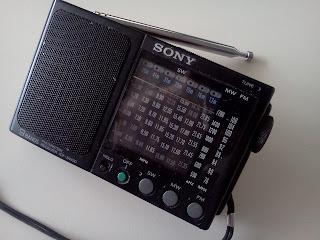 My oldest memories of shortwave radio are of sounds. Interval signals come to mind first. For those of you not in the loop, Shortwave stations usually broadcast a short song, or just notes before signing on. This made it easier to find the station you were looking for back before direct frequency readouts were affordable. Many stations still use them today, but it's not as necessary. Utility stations created the most interesting sounds. I learned quickly that almost everything that seemed like noise, was actually some form of communication, except for static of course. I figured out from reading my guides and magazines what most of these were. There were two mystery noises though that were very interesting. The first was only a mystery for a little while. The woodpecker. On several bands at once, a noise like a woodpecker would travel across the frequencies. It was usually annoying, and sometimes would be powerful enough to cover up what you were listening to. It had been speculated that the noise was some sort of over-the-horizon radar. This theory was confirmed after the fall of the USSR, and was in fact called Duga-3. The woodpecker disappeared altogether in 1989. The other noise I never figured out. I always described it as bagpipes. It would play a short sequence of about 10-20 notes, and repeat. The tune was almost always the same. It also seemed to be on multiple bands at once, but not spread across many frequencies like the woodpecker. Does anyone else remember this? The only other detail I remember is that the tune changed slightly before it disappeared for good. My father grew up in the 'Radio Era' which made him more radio-aware than my children are now. He was by no means a hobbyist, but knew enough to tell good from bad. He knew that AM radios had to be turned for best reception, and a good swiveling whip antenna was necessary for FM reception. For him, the radio needed to be able to pick up his NPR stations, WCBS-AM, and get the Mets games when he was on the road. I ran a sales territory for our family business. As Dad got older, he eventually came off the road, and ran the company from inside. Every now and then though, he would schedule to ride with one of his salespeople to keep an eye on things. He rode with me for few days once on my Northern New Jersey run. Thursdays on that run, I would sometimes stop at the offices of Gilfer Shortwave, and chat with Jeanne Ferrell and Paul Lannuier. I had purchased several radios there over the years, and would buy the various shortwave books and guides from them as they were released. That one Thursday that Dad came along, he got a kick out of Gilfer, and all of the radios. He and Paul talked for a bit, and he purchased a Sony ICF-SW20. Partly because he really liked the quality of the little radio, and partly because I think he liked the folks at Gilfer as much as I did. Dad had this radio from then, till he passed away in December 2009. It was his main radio. I saw it on his nightstand, in the bathroom, and on trips back east to visit us. Even with all of the selling and swapping I've done lately with my radio collection, I will never get rid of this radio. To me it was an acknowledgment from dad that my interests in radio were appreciated, and is a memory of the man I miss. It currently lives on my desk at work, sometimes called to duty for news, and music. Thanks for the radio Dad! I'll pass it down the line someday to Alec. 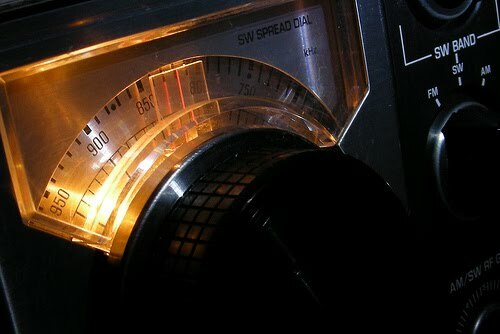 In the seventies, the idea of a radio with ACCURATE display of the frequency was at first left to high priced bench radios. The rest of us would have to guess at the frequencies with our portables. As some of the earlier direct-readout radios appeared that were more mainstream (read: affordable), I started to save up for something that would work better for me. Sony and Panasonic seemed to be competing at the time, releasing similar technology, and features at about the same price point. Panasonic's entry was the now highly-regarded RF-2200/DR22 model. 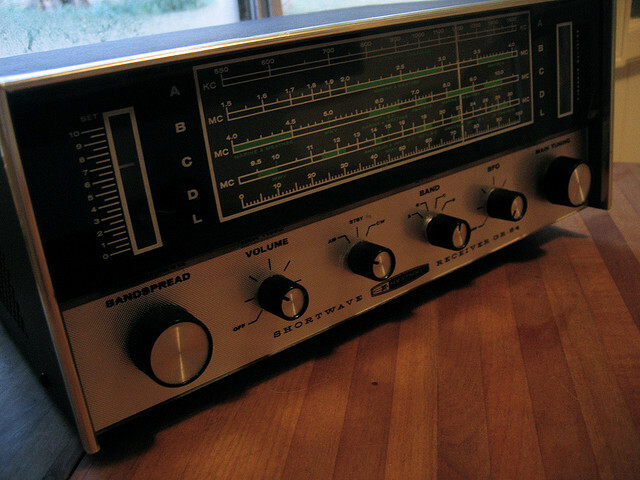 The Panasonic was a large analog set, known for it's performance. It had a crystal-based calibration setup that allowed you to calibrate a band-spread readout for each band you were tuning, Sony's entry was the ICF-5900W. The reviews at the time praised both radios. The Panasonic had the edge on audio (partially because of its HUGE cabinet), while the Sony was clearly more compact and easier to deal with. I had saved up for one of them, and the Panasonic won, after a local department store advertised it one Sunday for somewhere around $140 I think. For the first time, I knew what frequency I was on without having to find a known station first and play "creep-and-guess". It was also my first portable with a useful BFO for utility and ham listening. The Panasonic became the center of the collection, with a couple of portables surrounding it, and a Mosley CM-1 ham receiver that was purchased to encourage me to get my license. As digital portables evolved, one Sony model stood out as a particular bargain in performance. Sometime in the early 80's I purchased a Sony ICF-6500L. The Sony was much more portable than the RF-2200, and didn't need to be re-calibrated every 1 or 2 MHz. I gave the RF-2200 to my brother Paul. My sister in law still proudly displays it front and center as her main radio. The 6500 was accompanied by some less expensive portable at the time. A Toshiba RP-F11, a Magnavox D1875, an Emerson PSW-4010, a Realistic DX-370, and a few others that I may not remember. The Emerson recently turned up though when I was cleaning out my old garage. It had unfortunately not weathered the years so well. The Emerson was an interesting find. I think I purchased it at the Emerson factory outlet store in NJ. For a cheap radio, it performed very well, and had very powerful audio output. I used to to drive a good-size set of external speakers with it, and used it as a shop radio for years. All of these were sold off at some point, or given away, except the Emerson. The Sony went to a good friend who I think still uses it. The Mosley went at a ham auction, along with some other ham gear. I'd love to pick up another 6500 but they bring quite a premium on eBay in good condition. I think the Emerson is another I would like to replace. I missed a NIB example once recently that came up for auction. Have to keep watching. The next evolution for me was to PLL-tuned radios. More later. 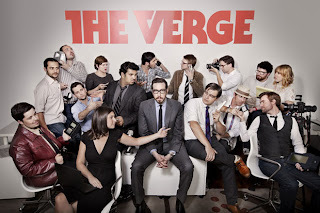 11 and a half years ago, I joined the Tech industry. My career and my hobby merged at that point. I know that some people say that you should keep the two separate, but it works for me. 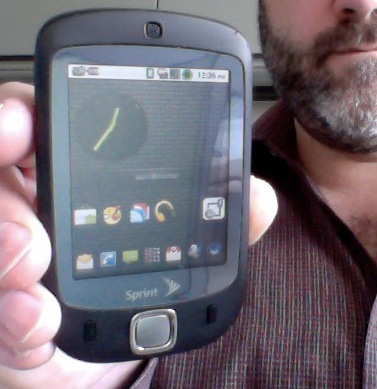 I've decided to look back at the various technical interests I have had, and write a bit about them. I feel that everyone has something they do well. The secret is to find it. As a child, my first fascination was with record players. I was obsessed with them and constantly tried to learn how they worked. I broke a few family phonographs trying to figure them out, and my mother tells me that I was always trying to make phonographs out of my tinker toys. One even "played" records. I used a safety pin as a needle and wedged a plastic margarine cup in for basic amplification. The record player obsession mellowed and in later years, turned into a great love for high fidelity equipment. More on that in a later post. My brothers had radios. I remember Lee had a Wards Airline radio at some point and he used to see how many stations he could get. Chicago, Pittsburgh, Baltimore, these were places that were far away. 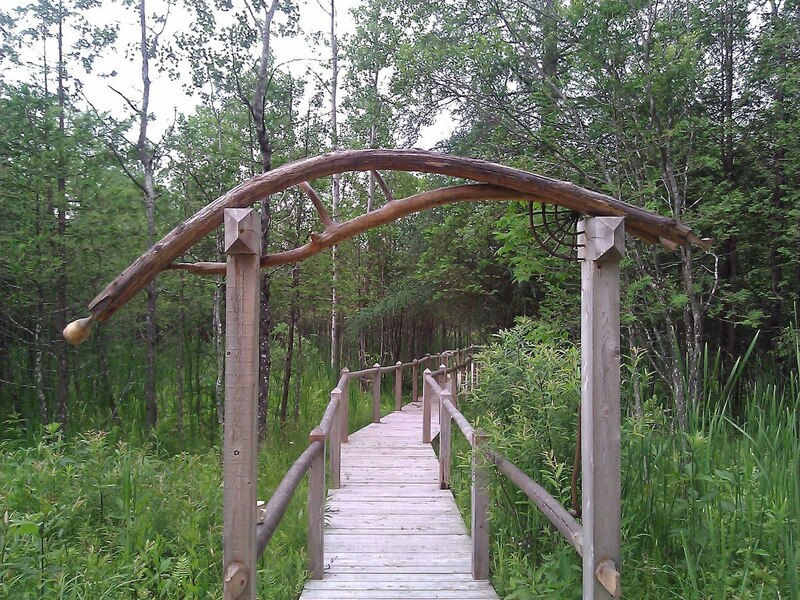 Listening to a voice from these places was like magic to me. I started to listen myself. We had a close family friend who called herself The Baroness Charlotte Serneaux Gregorin. Charlotte had travelled the world, and collected many worldly things. 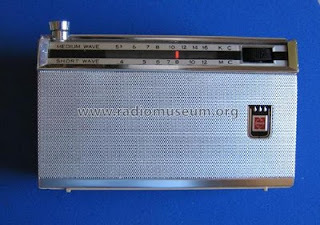 Upon hearing that I was interested in radio, she gave me a small National Panasonic 2-band portable radio, an R-803H. The AM portion of the radio got used right away. The shortwave band confused me though. I caught stations, but they moved around, and changed languages. I had a copy of Communications World laying around for the White's Radio Log AM guide, and there was a small section on shortwave in the back. I think it was finally a book I found at Radio Shack that explained things. Then the radio really got a workout. This original radio started a lifelong love of shortwave radios. Not just for me though. When Charlotte upgraded me to another National Panasonic, an RF-355 I gave the R-803H to my friend David. He recently got back in touch with me after quite a few years, and thanked me for getting him interested in Radio, which he said started him along a path that defined his career. I still have the RF-355. It has long since passed it's mechanical half-life, and barely holds together, but is a reminder of where I came from, and the amazing woman that pointed me in the right direction. Mark Roberts, over at The Cosmos Monitor has 2 nice reviews of the new Tecsun PL-606, and a review of the Degen DE1123 (A radio I carry in my backpack).